Top Trumps World Football Stars Video Slot Guide & Review - Casino Answers! Top Trumps World Football Stars is a 5-reel, 15-line video slot developed by Playtech, featuring wild substitutes, scatter wins, mixed pay, a gamble feature, a free spins feature and a bonus feature. You can play the Top Trumps World Football Stars video slot at Bet365 Casino and William Hill Casino. This video slot is based on the World Football Stars pack of the popular Top Trumps card game. The World Football Stars video slot features many different current footballers including David Beckham, Ronaldinho, Zinedine Zidane and much more. For more details on the Top Trumps card game, please read our Top Trumps Football Legends Video Slot Review. Top Trumps World Football Stars is a very unique video slot. When you start the game, you will be given a list of seven different teams to play as. You will choose a left-side team (pays from left to right) and a right-side team (pays right to left). Your choices are World Cup powerhouse teams Argentina, Brazil, England, France, Germany, Italy and Spain. Choosing each team will give you three unique player symbols. We have listed all of the players from each team in order. The first player will be worth the most at 5000X your line bet, the second player is 1000X and the third player is 500X. To play the Top Trumps World Football Stars video slot, you must first select one of the following coin values: $0.01, $0.05, $0.10, $0.25, $0.50, $1, $2 and $5. Next, you can use the “Bet Per Line” button to set your bet per line at 1-10 coins at your desired coin value and the “Lines” button to set the number of active lines at 1-15. This makes the smallest possible bet on World Football Stars $0.01 and the highest possible bet $225 per spin. Top Trumps World Football Stars gives slots players plenty of options, whether they are casual players or high rollers. Once you are ready to play Top Trumps World Football Stars, use the “Spin” button to play with your desired wager or you can use the “Bet Max” button to play 10 coins and 15 paylines on your desired coin value. While the 5000X payout for the footballer symbols may have sounded good enough, the wild symbol is even better! Hit 5 wild symbols in the Top Trumps World Football Stars slot game and you will win 10,000X your line bet! The wild symbol substitutes for all regular symbols in the game (the scatter symbol, bonus symbol and free spins symbols are excluded). Top Trumps World Football Stars has a mixed pay feature, which is any players from the same team that are not all the same symbol. During regular spins, mixed combinations of the first team pay left to right and the second team pay right to left. On free spins, mixed combinations pay left to right as well as right to left. The wild symbol does not participate in mixed pay combinations. A flag symbol of a single team on the first and fifth reels simultaneously will award you with 12 free games. Only players from the triggering team will appear on the reels during the free games feature. Paylines pay both ways for all symbols, including mixed pay. One payline can pay in both directions simultaneously. The player will get the highest win in each direction, using 5 of a Kind only once. The bonus symbol and free games symbols do not appear during the free games feature (thus free games cannot be re-triggered). The Top Trumps World Football Stars slot machine has a bonus featured called the Pass the Ball Bonus. To trigger this feature, the soccer ball bonus symbol must appear on the second reel with a left side team member to its immediate left OR a soccer ball must appear on the fourth reel with a right side team member to its immediate right. The player will kick the ball and it will be passed to all of his team members on the reels, sound effects included. You will win 3X the total bet for every player that touches the ball. The Pass the Ball bonus feature cannot be triggered during free spins. After any win you receive on Top Trumps World Football Stars, you can choose to risk your winnings to double or double half of your winnings. Hit the “Gamble” button after a win to start the gamble feature. Once you have chosen either “Double” or “Double Half,” the dealer will turn over the the card at the far left. You must choose which of the four remaining cards will be higher than the dealer’s card to win. To back out and collect your winnings, use the “Collect” button or you can play more rounds. Each casino will have a double up limit that is listed in the paytable. As an example, the double up limit is $5000 at Windows Casino. One of the other gameplay features on the Top Trumps World Football Stars casino game is an autoplay mode. Simply type in the number of autoplay spins up to 99 and hit the “Auto Start” button to begin. You may cancel the autoplay spins by using the “Stop” button that replaces the “Auto Start” button, as opposed to the yellow one. The yellow “Stop” button replaces the “Spin” button during a spin and can be used to skill stop the reels on the Top Trumps World Football Stars video slot game. Top Trumps World Football Stars is an excellent video slot that is perfect for football and soccer fans worldwide. Not only can you select two different teams consisting of your favourite soccer players, but you also get tons of special features and a 10,000 coin top jackpot. Before you start playing the World Football Stars slot, you can triple your bankroll to get the most number of spins possible to play the game. New players will get a 100% up to $200 signup bonus when they sign up at Bet365 Casino! What is the Top Trumps card game? Top Trumps is a popular card game with many different packs available, including World Football Stars and Football Legends. Other Top Trumps card packs include Star Wars, The Simpsons, WWE, DC Comics Super Heroes, Indiana Jones and many more. The game is played like this: Two or more players can play. Each card has its own stats. The cards will be dealt out to all of the players, with each player getting at least one card. The first player will select the category from his first card and read out the value. The other players will then read their value from that same category. The player with the highest value will win the “trick” and take all of the losing cards to place them at the bottom of his pile. The winning player will then take their next card and pick the category for the next round. 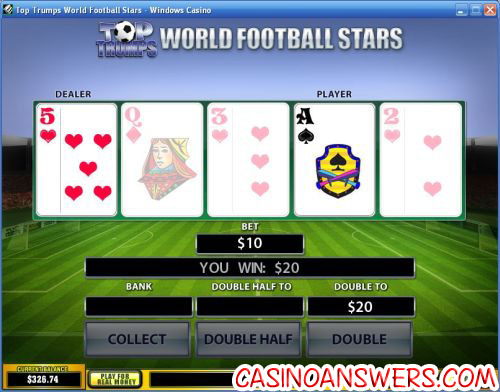 Are US players able to play the World Football Stars slot game? Slots players based in the United States are unfortunately unable to play Top Trumps World Football Stars at Playtech casinos. However, American players are free to sign up and play a soccer-themed slot machine called Global Cup Soccer. 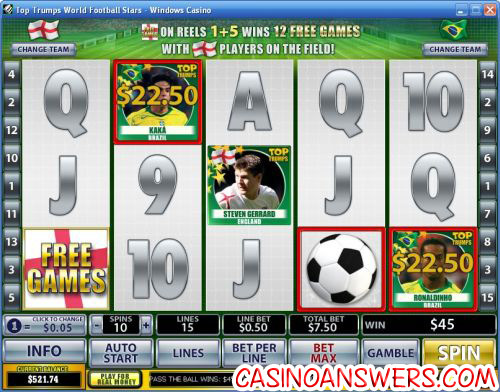 What footballers are featured in the World Football Stars slot? Top Trumps World Football Stars features the following popular football superstars: Alessandro del Piero, Carles Puyol, David Beckham, Francesco Totti, Herman Crespo, Juan Roman Riquelme, Jurgen Klinsmann, Kaka, Lionel Messi, Lothar Matthaus, Luca Toni, Michael Ballack, Patrick Vieira, Raul Gonzalez, Reyes, Ronald, Ronaldinho, Steven Gerrard, Thierry Henry, Wayne Rooney and Zinedine Zidane. Where is the trumps casino game?